The "We Back Pat" T-Shirt is now available for purchase online. 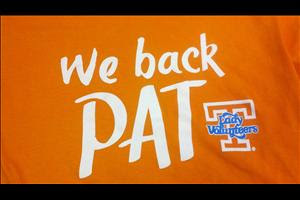 The University of Tennessee Athletics Department has launched a new campaign called "We Back Pat." The program will benefit Alzheimer's Tennessee and UT Medical Center. The shirts are available online for $10 (see link below). The shirts are also available at the UT campus bookstore. 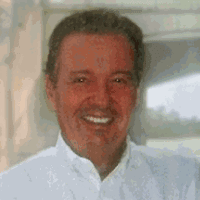 You might recall that I wrote about Alzheimer's Tennessee last month, they recently left the Alzheimer's Association and reformed their own separate entity. This will probably turn out to be a real "shot in the arm" for the organization. I can already envision the entire crowd at this weeks first University of Tennessee football game wearing these shirts (if they can make enough of them). The football stadium holds more than 100,000. For sure, everyone in the crowd for the first Tennessee women's basketball game will be wearing these shirts. Who knows, the same thing might happen at the first men's basketball game. The arena holds over 21,000 fans for a basketball game. This could mean incredible T-shirt sales, and funding for Alzheimer's Tennessee. This is exciting. I intend to get one. Take a look at this video, I like it. Go here to buy the We Back Pat T-Shirt online.